There are many ways to enjoy Prague and one of them is on a bike. You can have your own or borrow one (there are several companies with different system of hiring the bike), you can travel the city centre – but be careful, there are new rules for bikers in the centre of Prague! You can also go further out. I like exploring the city on a bike and searching for hidden surprises. 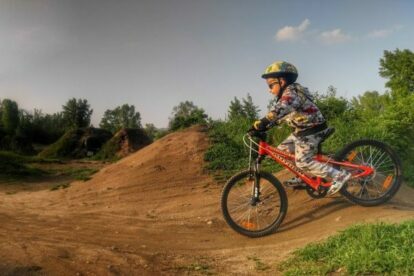 This pump track in Karlín is one of them. When I went with one of my kids for a short cycling trip on Rohanský ostrov (called Island but technically the island does not exist anymore), I found this pumptrack in the middle of nowhere and I instantly fell in love with it. Here you can enjoy the freedom of going up and down and choose your own path – this pumptrack is most of the time empty, although sometimes you may meet there one or two other bikers but don’t worry, there’s lots of space. You can try what you are capable of even with a hired basic bike – there are jumps, yes, but you don’t have to use them, and you just test your abilities here. You can easily get here from one of the main cycling routes in Prague: this one is called A2 and is suitable for everyone as it goes along the Vltava river for the most time.